I have zero issues with making it abundantly clear that I do not like to cook. I do, however, occasionally like to bake something. You know, to satisfy my seemingly insatiable sweet tooth. Looking back, I’m not sure how I managed it, but I once went 8 months without ingesting a single drop of sugar in any form, artificial sweeteners, or white flour. I was never in better health than I was then. Why I’m unable to repeat that act, for the sake of my health, I do not know. Willpower is a funny beast. I’m a much better baker than I am a cook. 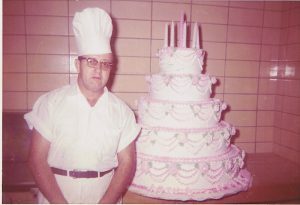 I guess I get that from my Uncle Roland, who was a baker in the Navy, and then also worked at a bakery in Kansas City, after his time in the service. Just look at this creation of his! 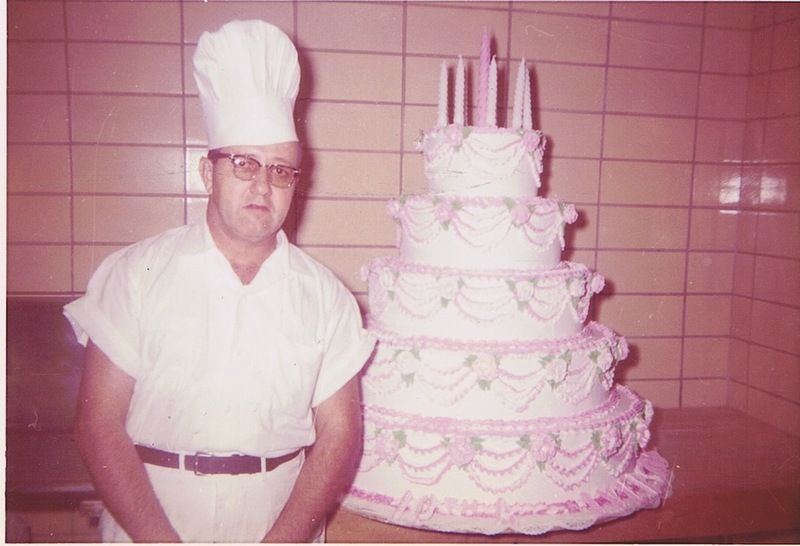 My talents fall somewhat short of his, though, in that I could not decorate a cake like that to save my life. I can, however, follow a recipe for baked goods, and I prefer said recipe be easy. If I happen to be hungry whilst browsing Facebook, sometimes a recipe there will catch my eye, and that’s just what happened with the cake I decided to make yesterday. It’s called Crazy Banana Cake with Cream Cheese Icing. And it’s delicious. This particular cake actually caught My Cowboy’s eye first, or I might have been able to resist, but he made me look at it, and then, of course, I wanted it, so then I had to make it. And eat some of it! And while the above cake is really, really good, I think it’s an even tie with this Banana Bread Brownies recipe. I think I’ll have a hard time choosing between the two next time I need to do something with ripe bananas! And if you’re in the mood for cookies, jump over to The Life of Hazel Ilene and check out the recipe I posted today. You can make these ahead and look like a cookie-baking rock star the next time you have impromptu guests! Now I REALLY want that banana cake and I don’t have the bananas. I’m hungry already just reading your post. Don’t dare go look at the recipes becuase it’s Lent. If I read them, I’ll make some, and then eat some. I have no will power.